How do I access Tanda? Employees need to be sent an email invitation from a manager to access Tanda. This email will contain the next steps to setting up your account. Tip: Check all areas of your email inbox if you are someone who receives lots of email, you can search for 'Tanda', otherwise, check with your manager that the invitation email has been sent and that the address your employer has on file is correct. Use your 4 digit Passcode to clock in at the start of your shift and clock out at the end of the shift. You may also be required to clock in and out for your breaks, just check with your Manager. If you haven't received your Passcode, you can try to last 4 digits of your Mobile Phone Number first (generally this is most employee's codes) otherwise please ask your Manager to send you a copy of it. You can pass on this article if they need assistance. Your Manager can either invite you to login, so just send them this article if they aren't sure how to or you can just enter your Email address and click "Forgot my password" and Tanda will send you an Email to setup a Password to login to the App. Tanda is also accessible through a web browser (Safari/Chrome). You can login to Tanda to view your rosters & timesheets and apply for Leave or Unavailability. Before you can login to Tanda you will need a username (your email address) and a password. This will be setup by your employer and you'll receive a Welcome Email. You can pass on this article if they need assistance. Once you have your login details, visit my.tanda.co/login to login to Tanda. Once logged in you will see Timesheets, Rosters and Time Off. Some of these options may be hidden based on the options set by your employer when setting up the Tanda account. 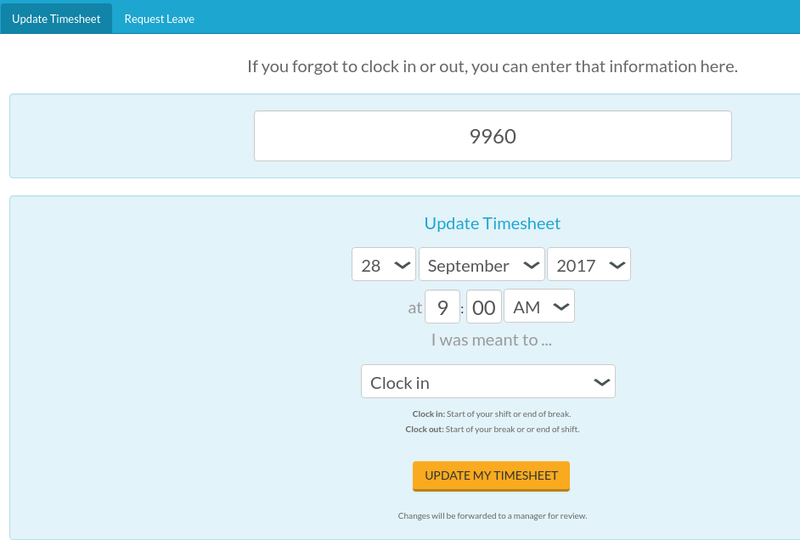 You can update your missed clock-ins and apply for Leave via the Tanda Employee Portal - my.tanda.co/portal. This can be accessed on any online device including your phone, computer and tablet. If you need any assistance with Tanda, just speak with your Manager first and they can escalate to Tanda Support should they need to or click the blue chat icon in the bottom right corner if it's urgent.